Why does simplicity seem impossible? Overflowing schedules, complicated relationships, raising kids in our corrupt culture and trying to juggle too many tasks at one time. All things I struggle with! Anyone else maneuvering through to do lists with items still lingering undone at the end of each day? Somehow it feels like the list lengthens as days shorten. The craziness of daily life almost makes living well work against itself. How can healthy habits offer our minds and bodies respite when we’re too rushed to claim the profits? I think we need to redefine living well into exactly inside-out compared to what the culture claims. We need to make it more about peace and purpose than aching for a certain aesthetic. It’s about slowing enough to sense how blessings abound in our hard work. Living well includes making the most of moments and tending to our mind and spiritual health especially during trying times. Here are two places to start with living well inside-out…. Let’s get back to the basics when it comes to just about everything, especially living well! Let’s isolate ourselves from the madness of marketers, breathe deep and live well, sweet and simple. Because without a cleansing breath, we hold toxic stress and that’s right where our struggle starts—instead of slowing down to sense Christ’s comfort, we cling to complicated cultural rules for wellness and end up eating for comfort (uhhh…or is that just me?). What’s even more intriguing in a self-sabotaging way is how we fail to remember God created us yet we continue to try and take control. As His creation, we’re assured He cares and knows just what we need. When we seek Him in ALL things (even wellness), everything seems so much simpler! We may take seriously the tender care of our beautiful bodies but, with Him, suddenly even eating clean and exercising becomes a joy when we remember we’re caring for His creation! What if self-care started with soul-care and suddenly wellness felt more like worship!? We must practice the presence of mind to savor sweet moments of simplicity. When we struggle with life’s complications or overschedule ourselves, we end up living in a flurry of fast paced days. Before we know it, we’re unable to slow down and savor the wonderful effects of living well in the first place. How can I enjoy the daily exercise if I only slow down when an ache or pain pleads me to rest? If preparing food feels like a burden, how can what my hands create bless the bodies I feed? But if I slow down enough to at least give thanks during moments in-between the fast-paced bustle of real life, suddenly I sense the sweetness of what God’s giving through it all. Maybe it’s just my heart aching with conviction but somehow it seems results are our addiction. We want to see what becomes of our efforts before we ever slow down to savor the path we’re on. Instead of self-gratification let’s infuse our days with gratitude. Yeah, let’s slow down enough to savor each simple blessing until everything seems a bit sweeter! And now a little sweet treat to help you slow down and savor. This simple recipe is meant to be relished! It’s creamy and crunchy, easy to whip up, and offers just what your afternoon needs when you crave that moment to savor something sweet. I even slowed down enough to sit and eat this nutritious treat. And if I didn't know any better, I'd say this creamy treat tastes a little like cookie dough yogurt! 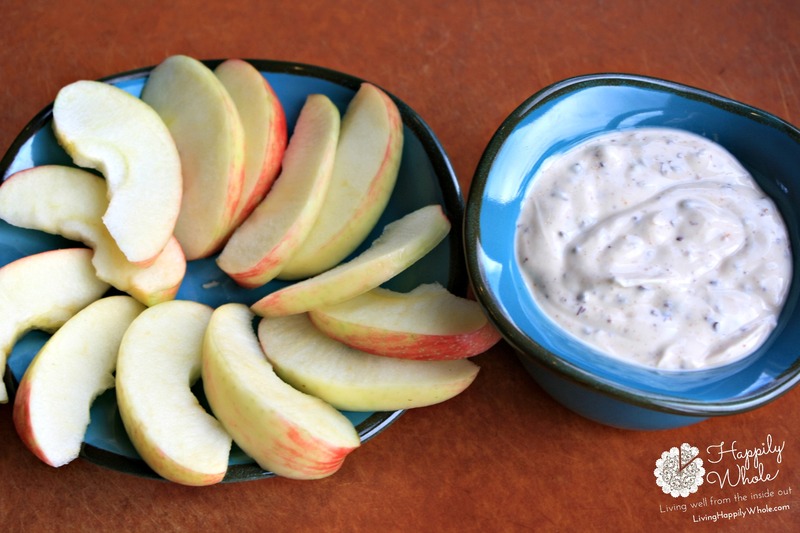 Mix all ingredients up in a bowl and enjoy right from the spoon or as a dip on apple slices! You can also use whole grain or gluten free graham crackers. But we were keeping it real!